The pilots of long-range aviation perform regular flights over the neutral waters of the Atlantic, the Arctic, the Black Sea and the Pacific Ocean both from base and operational airfields. 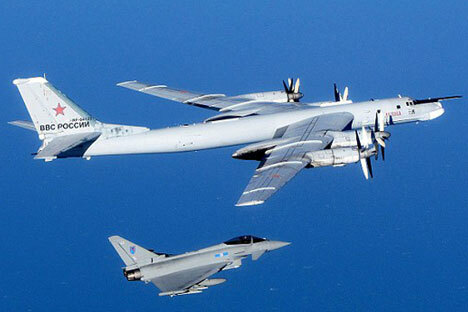 Russia’s nuclear capable Tu-95 bombers escorted by Su-35 "Flanker" fighter jets performed routine flights over neutral waters of the Pacific Ocean along the Aleutian Islands on May 4, the Defense Ministry said, TASS reports. "On May 4, 2017, Tu-95MS strategic bombers of long-range aviation escorted by multi-role Su-35S fighter jets carried out routine flights over neutral waters of the Pacific Ocean along the Aleutian Islands," the ministry said in a statement. Under the approved plan, the pilots of long-range aviation perform regular flights over the neutral waters of the Atlantic, the Arctic, the Black Sea and the Pacific Ocean both from base and operational airfields. "All flights of planes are performed in strict compliance with international rules of using airspace over the neutral waters, with no violation of borders of other states," the ministry said. The ministry noted that a spokesperson for the North American Aerospace Defense Command (NORAD) Ashley Peck said that the flight of Russian bombers and fighter jets near Alaska was professional and safe.